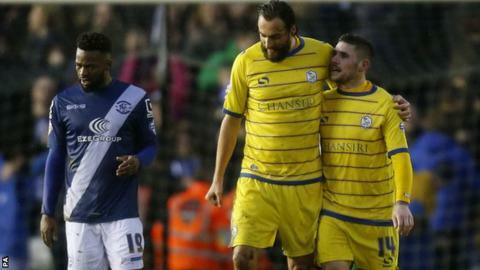 Gary Hooper scored twice in two minutes as Sheffield Wednesday came from a goal down to win at Birmingham City. Clayton Donaldson's goal in first-half injury time gave City the lead as he slotted home after Michael Morrison had charged down a Tom Lees clearance. But Hooper smashed home the equaliser off the crossbar following neat play between Atdhe Nuhiu and Barry Bannan. The striker got the winner soon after as he finished from close range from Fernando Forestieri's pass. The win, which saw Wednesday move back into the Championship play-off places, came at a big cost to Carlos Carvalhal's side as they lost three players to injury. Kieron Lee was hurt in the warm-up and replaced by Vincent Sasso before Keiren Westwood and Sam Hutchinson clashed with one another as the Wednesday defence blocked an eighth-minute City attack. Westwood was stretchered off after receiving lengthy treatment on the pitch with a suspected concussion, while Hutchinson's knee injury meant he could not continue despite staying on for a few minutes after play was eventually restarted. "To go in 1-0 up at half time I was really pleased but felt we should have done a little more to stop the game becoming too open at times. "When you have the attacking players Sheffield possess you know they only need one chance. "In the second half we had another great chance when Donaldson missed from close range." "Hooper's first goal was fantastic. Some of the one-touch play on a difficult pitch was sublime. "To go and get the second goal a few minutes later made us ecstatic. "We were hindered losing two players so early in the game but we have a very good squad." Match ends, Birmingham City 1, Sheffield Wednesday 2. Second Half ends, Birmingham City 1, Sheffield Wednesday 2. James Vaughan (Birmingham City) is shown the yellow card for a bad foul. Ross Wallace (Sheffield Wednesday) wins a free kick in the defensive half. Attempt missed. Fernando Forestieri (Sheffield Wednesday) right footed shot from the right side of the box is close, but misses to the right. Assisted by Gary Hooper. Substitution, Birmingham City. Viv Solomon-Otabor replaces Jacques Maghoma. Substitution, Birmingham City. James Vaughan replaces William Buckley. Goal! Birmingham City 1, Sheffield Wednesday 2. Gary Hooper (Sheffield Wednesday) left footed shot from very close range to the bottom left corner. Assisted by Fernando Forestieri with a cross. Corner, Sheffield Wednesday. Conceded by Jonathan Grounds. Attempt blocked. Atdhe Nuhiu (Sheffield Wednesday) right footed shot from the centre of the box is blocked. Assisted by Fernando Forestieri. Goal! Birmingham City 1, Sheffield Wednesday 1. Gary Hooper (Sheffield Wednesday) right footed shot from outside the box to the high centre of the goal. Assisted by Atdhe Nuhiu. Offside, Birmingham City. Jonathan Grounds tries a through ball, but Clayton Donaldson is caught offside. Foul by Ross Wallace (Sheffield Wednesday). Diego Fabbrini (Birmingham City) wins a free kick on the left wing. Foul by Lewis McGugan (Sheffield Wednesday). Substitution, Birmingham City. Diego Fabbrini replaces Jon-Miquel Toral. Attempt missed. Jacques Maghoma (Birmingham City) right footed shot from outside the box is close, but misses to the left following a set piece situation. Daniel Pudil (Sheffield Wednesday) is shown the yellow card for a bad foul. William Buckley (Birmingham City) wins a free kick on the right wing. Attempt missed. Maikel Kieftenbeld (Birmingham City) right footed shot from outside the box is high and wide to the right. Attempt saved. Ross Wallace (Sheffield Wednesday) right footed shot from outside the box is saved in the top centre of the goal. Assisted by Atdhe Nuhiu. Offside, Birmingham City. Stephen Gleeson tries a through ball, but Clayton Donaldson is caught offside. Hand ball by Jack Hunt (Sheffield Wednesday). Substitution, Sheffield Wednesday. Atdhe Nuhiu replaces Aiden McGeady. Attempt missed. Lewis McGugan (Sheffield Wednesday) left footed shot from outside the box is too high following a corner.